On Thursday afternoon, Peter Meyer, accompanied by Peggy Anderson and Joseph Holodook, presented a petition, with more than a hundred signatures, to Mayor Rick Rector and Council president Tom DePietro, regarding the current revaluation of real property now underway. 4. Adjust assessed valuations so that property maintained by the same owner(s) between 2018 and 2019 is not penalized by an assessment that increases more than twenty percent. Furthermore, we request both the executive and legislative branches hit the pause button, review the entire process, and seek out equitable solutions while also protecting taxpayers from innumerable potential Article 78 lawsuits, which will further penalize already overburdened property owners. Back in 2010, Mayor Rick Scalera did exactly what the petition is now requesting. Citing "fatal flaws" in the 2010 tax roll, Scalera announced that the City was scrapping the 2010 assessments and "voluntarily reverting back to the 2009 assessment rolls." The circumstances in 2010 were somewhat different. The decision wasn't made until the end of July, after the challenging and grieving were over, and the final assessment roll had already been submitted. The petition today is calling for the process to be stopped now, before the challenging and grieving process is complete and before it is known if the process will bring satisfactory results for those property owners whose homes may have been unfairly assessed. Also, in 2010, the problem was with reassessments made by then city assessor Garth Slocum, who had done what was called a "desk audit," and the City was planning to do a citywide revaluation the next year. Now, in 2019, we are in the middle of a citywide revaluation. The petition's fourth request seems a bit unrealistic. With few exceptions, the 2018 assessments on properties are the same as they were after the last reval in 2012. Given the rapid appreciation of property in Hudson in the past seven years, the notion that assessments on properties that have not changed hands should increase only 20 percent would not reflect actual changes in property value, and the goal of reassessment is to establish the current market value of real property--market value being defined as "how much a property would sell for under normal conditions." GAR Associates, the group that is doing the current revaluation, did the revaluation in 2011 as well. To remind myself of that experience—beyond my personal experience of challenging and grieving my assessment, which resulted in an acceptable outcome—I checked back in old Gossips posts and found this one from May 8, 2012: "Brouhaha about B&Bs." No, it's not about how short-term rentals are driving out full-time residents. It's about how, in the last reval, GAR reclassified all B&Bs as commercial properties, even those that met the criteria of a home-based business: a residence that is owner-occupied, has no more than five guest rooms, and lodges no more than ten adult guests at a time. Back in 2012, GAR maintained that the Office of Real Property Tax Services (ORPTS) manual said nothing about B&Bs. One wonders if that omission has since been corrected. That this firm got hired *again* by Hudson after the previous mess-up should raise eyebrows. And GAR has had problems with at least one other municipality which hired it. Taghkanic got a big refund from them after they discovered irregularities related to GAR keeping a retainer for services not performed. Please add my name to that petition ! I'll send it right over, Vince. Actually, Carole, Mayor Scalera did not do in 2010 "exactly what the petition is now requesting." There were several reasons he changed his mind, one of which was that the school district had already "certified" the roll, making the rollback almost impossible. But as you point, it was late July and well past the all the "grieving." The citizens who signed our petition are grieving now, in April, giving the Mayor and Common Council ample time to scrap the current, fatally flawed assessment and do it right. As to our request to put a cap on assessment increases for current owners (we thought 20 percent was reasonable), it is only unrealistic if you buy GAR's arbitrary and capriciously drawn nine "neigborhood" boundaries. That allows a single block or a few outlandish sales to dictate the value of dozens of properties that just happen to be on the wrong side of the street. The impression that "actual changes in property value" have caused these huge assessment increases a creative, but fake, way of inflating value. In fact, housing sales in Hudson, taken as whole, have been relatively stable these last several years. The City needs to scrap these Neighborhoods--a form of property gerrymandering that is as unfair and unequal as the same practice is in the political world. Carole, you are generous to describe the petition's fourth request as "a bit unrealistic." It is unquestionably illegal to assess differently based upon the duration of ownership. To quote one case that touches on this kind of discriminatory assessing, "we conclude that the respondents' practice of selective reassessment of only those properties in the village which were sold during the prior year contravenes statutory and constitutional mandates. * * * The respondents' disparate treatment of new property owners on the one hand and long term property owners on the other has the effect of permitting property owners who have been longstanding recipients of public amenities to bear the least amount of their cost. We can conceive of no legitimate governmental purpose to be served by perpetuating this differential treatment * * * This approach lacks any rational basis in law and results in invidious discrimination between owners of similarly situated property. Thus, the respondents' method of reassessment violates the equal protection clause of both the United States Constitution (U.S. Const. 14th amend.) and the New York State Constitution (N.Y. Const., art. I, § 11)." Krugman v. Board of Assessors of Village of Atlantic Beach, 141 A.D.2d 175 (N.Y.S. Supreme Court, Appellate Division, 2nd Dept.). KD,You apparently failed to read item 4 of the petition closely, as it requests consideration for a less onerous assessment, that is an assessment not above 20% incerease for long time property owners. The case you cited concerned a village where long time property owners were not reassessed at all, only new purchasers were subject to re-assessment. 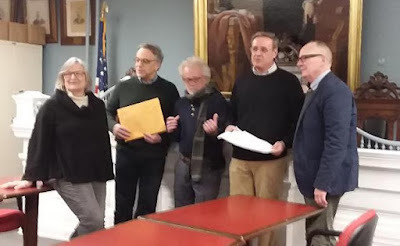 The petition in Hudson does not purport to be a legal document, it intends to show the thoughts and concerns of numerous citizens, and thus has value.